I am wondering if there is anyway to make this quilt without the outer border so that it is a sort of prarie point "taggie" quilt. I just can't firgure out how I would do it with batting. I've made taggie blankets before, but I just birth those without a batting and then topstitch around the edge. Could I attach my batting to the backing and do the same thing here? Any other ideas? Ok, now that I've looked around some more I have a few new questions. How do you assemble the sandwhich? 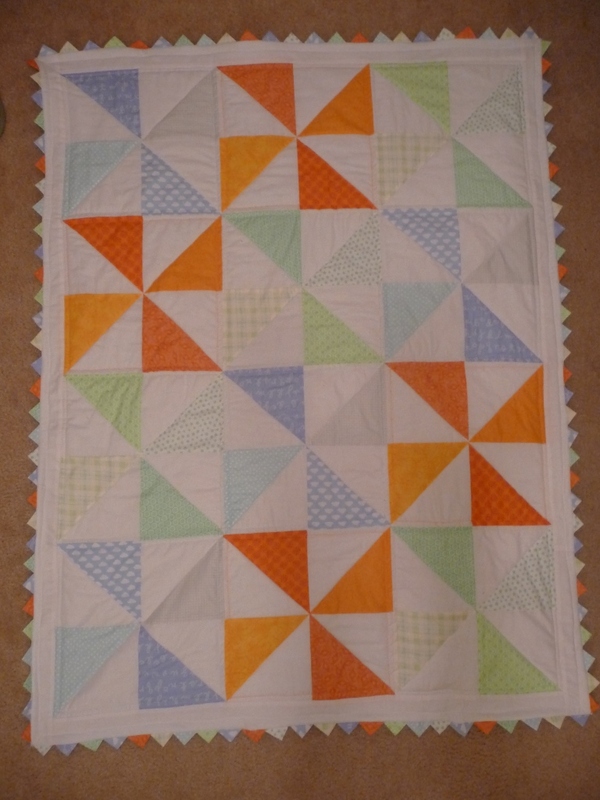 Do you quilt before or after adding the PPs? How is the backing sewn on? Would birthing the quilt work? It is only a baby quilt. Yes definately. There is a book about borders but also just sew at desired size. Then same as you put points in other section. . I did my quilting first, then put praire points laying flat on the front and sewed all the way around with a small strip on top ready to stitch down. This last stitching down pulls the points out straight. PM . Last edited by DOTTYMO; 06-30-2013 at 10:43 PM. 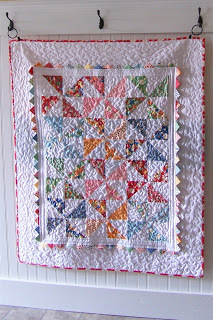 You sandwich the quilt like any other Sew the prairie points to the edge of the top. Use lots of pins and then sew around the edge. Make sure all are sewed, turn under the back and sew around there. I did it by hand, using a doubled thread and tiny stitches. Someone else may have a better idea. Kaye Wood has directions on her web site. Pin like crazy all around and sew like you normally do, making sure that the points don't slip out of the seam. Leave an opening to turn. Then stitch that opening closed. Top stitch all around the edges below the prairie points to keep them laying flat. Try a small square first to get the hang of the method. Maybe this could be a matching pillow for the quilt. This is the same method you would use for making a pillow cover with a ruffle (minus the batting). Then pin and sew as I described. You do the three layers just as you would for birthing a quilt but put the prairie points inside the layers so when you turn it out they will be on the outside. I would sew the points together first so you don't have to struggle with every triangle. Clear as mud right? I hope you understand what I mean. I made a baby quilt with prairie points and it was easier than trying to get a binding to look right! I sandwiched all three layers like any other quilt and FMQ, keeping away from the edges at least an 1 1/2 inch. Then I added the prairie points to the edge (top side), adjusting so they come out ok on the corners and all points to the center of the quilt.....keeping the backing pinned out of the way....then stitch 1/4" from quilt edge....flip all points to the outside and press....then turn the backing under and sew, either by machine or by hand....hope this helps. I think if I was going to do it the birthing method, I would baste stitch the PPs to the top prior to sandwiching it to the backing. The points would be towards the center, base along the edge of the top. This is a quilt I made 2 years ago.